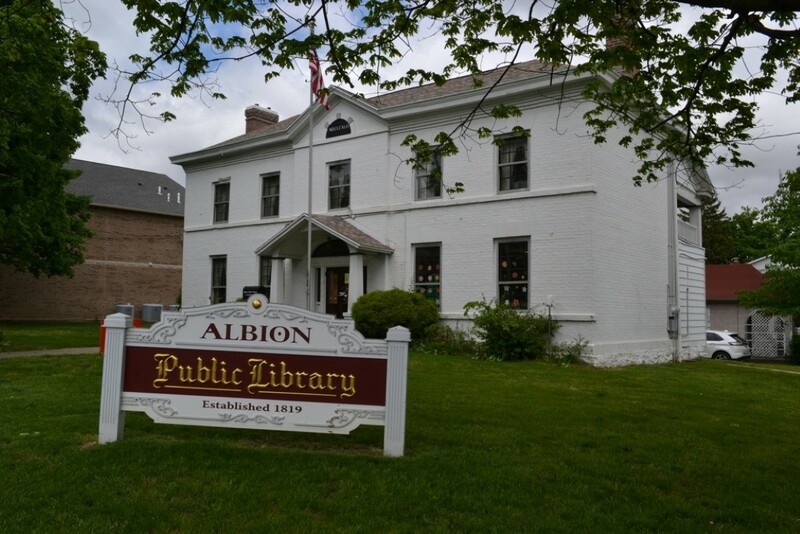 The Albion Public Library, located at 6 North Fourth Street in Albion, was the first public library in the State of Illinois, having been established in 1819. This first library consisted of books brought over by English settlers, supplemented by gifts of many choice volumes sent by relatives and friends in England. In the earliest days, the library was housed in the Market House, which was a log building sixty feet by thirty feet, erected on the southwest corner of the public square. In 1823 there was a complete reorganization of the library and the books were moved to the first courthouse in Albion when it was completed in 1826. Then in 1838 a two‐story brick building was erected in the courtyard for use as a school five days a week and every Saturday and Sunday it was used as a Reading Room. The library was housed in this building until 1856 when it was razed. The library existed in various locations for the next several years through the work of some women’s clubs by subscriptions, donations and sale of shares. From 1883 through 1916 the library was housed in institutions of higher learning in Albion, two of which were short lived. The first of those institutions was the Albion Normal School which was established in 1883, followed by the Edwards County Normal College in 1889. In 1887 the Albion Normal School secured the Dr. Frank Thompson residence across the street east from the southeast corner of the public square and the books were moved into one room there. This is the present location of the library; however the books would remain here only a few years at that time. Upon the completion of the new building for the Edwards County Normal College in 1890, the library was moved into that building. That school closed in 1891 and the Southern Collegiate Institute was begun in 1891 in the same building. That was to be the home of the library books until the SCI closed in 1916 due to financial difficulties. When the Southern Collegiate Institute closed in 1916, the building and grounds passed into private hands via the mortgage route. One hundred fifty books from its fine library, which was built upon a nucleus of books donated by Englishmen to the first public library in Albion, were given to the present Albion Public Library. In 1922 a city library tax was levied and the present library building was purchased. The building was erected in 1842 by Dr. Francis Burdette Thompson, an early Albion physician. Dr. Thompson used the building as a residence, office and hospital. Built in the Georgian style of architecture, the library building features a fanlight window over the walnut doors at the front entrance and sidelights on either side of the doors. The nine‐over‐six windows on the first story and the six‐over‐six windows on the second story are symmetrically arranged in true Georgian style. The hipped roof is flanked on each side by a chimney at the outer wall. A half‐circle of stone in a gabled area of the roof above the front entry is inscribed with the year 1842 in Roman numerals. porch, although that portion of the porch has now been enclosed to form another room for the library. A later addition has been built onto the east side of the ell rooms.